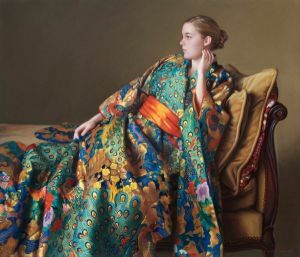 Evan Wilson's love affair with exotic textiles started as a young art student studying the "Old Masters" such as Peter Paul Rubens, Rembrandt, and van Dyck, as well as many of the great Italian masters like Michelangelo and Leonardo. While emulating these artists, Wilson became fascinated with their ability to capture the metallic glint of a button, or the intricate detail in the clothes worn by royalty in their portraits. "From the very beginning of my career, I have tried to incorporate beautiful textiles of this sort whenever the opportunity arises," states the artist. In this striking portrait, a young girl is wearing a traditional Japanese wedding kimono. This kimono shows a repeating pattern of colorful peacocks with very intricate embroidery, and even gold threads on the feathers. The bright tangerine sash complements the colors of the kimono. The concept for this image celebrates the Orientalist movement of Western painters such as Whistler and Sargent, who were infatuated with kimonos and featured them in their paintings.